Since plum tomatoes (also known as Roma) are always cheap and always in season, roasting them just makes sense. Roasting brings out the sweetness in this otherwise boring variety of tomatoes. I don't eat these tomatoes raw, they are best for sauces and cooking. 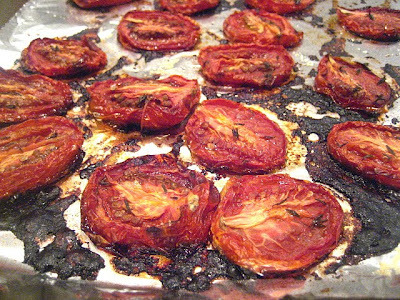 You can roast a whole bunch of them and have them for sandwiches, salads and even a tomato crostata (tomorrow's post!). They are delicious! Years ago, I would oven dry them at a very low oven temperature of 200F for 10 hours. But I found that I did not like the smell that was left in the kitchen after cooking them for that period of time, and I also don't like to go to sleep (or leave the house) with the oven on for such a long time period. (I don't leave the house with the dryer on either, I can tell you a nightmare story if you want). So.....I now roast my tomatoes at a higher heat for less time! They stay plumper and are not as shriveled as oven dried tomatoes. I will call them Semi Oven Dried! 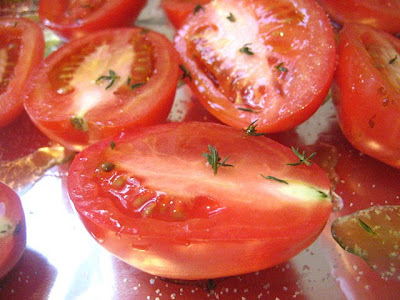 Cut your tomatoes in half and lay them on a baking sheet lined with aluminum foil, it makes cleanup much easier. 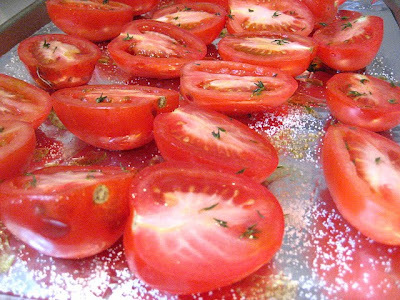 Drizzle tomato halves with olive oil and sprinkle liberally with kosher salt and fresh thyme leaves. Leave in the oven for 3-4 hours, until they look to your liking. I turn the oven off and let them sit another hour or so. Store in a container in the fridge for up to a week. You can drizzle a tiny bit of olive oil over them to keep them nice and shiny and moist. I make these all of the time - and LOVE Them! Great pics. Great technique. I never dreid them myself but have had friend who had good results. They turn out gorgeous Stacey. I should try this technique sometimes. Ah those are like "tomates confites", great way to get the natural sweet flavor of the tomatoes out and so good in so many dishes. Beautiful. Interesting method, definitely something I want to try. I bet they would be great for pizza or focaccia. I roasted a huge batch this past weekend. I always add a little bit of sugar to mine along with the salt. I've always done mine the long, slow way but this is a great alternative. I'm with you on the fast way, and I'm the same way with my dryer, a neighbors home just 2 blocks away, burned down because of this. I do this all the time - they are just grand. And I will change seasonings. And I will not leave the home with dryer going! Those look delicious. We really don't get good tomatoes here - even in the summer. I should really just make them this way for everything. Good advice. My new oven has a vegetable "dehydrator" setting which I'm itching to try! These look so full of flavor! Bet they'd be great on a sandwich -- plump and lovely. Love the Pics! This is what I do! We love these - we pop these on our pizzas on Pizza Night at our house. They are a great side dish, too - we use them for so many things! I luv these. I could eat them all right now. I did this with little grape tomato halves that I will use for little pizzas tomorrow night. Thanks for the tip!